Top 12 win cash and prizes! Registration opens one hour prior to tournament start time. If February is your birthday month, visit any kiosk and receive a free $5 buy-in for any tournament during the month. Limited seats available for free birthday buy-in. The Coral Reef Grille specializes in expedient, freshly made to order food items. Named for the 5 historic bridges located throughout the championship Sweetgrass Golf Course, the 5 Bridges Steak & Seafood House features nightly chef specials, signature appetizers, premium beef steaks and seafood. Order a Gift Card Today! 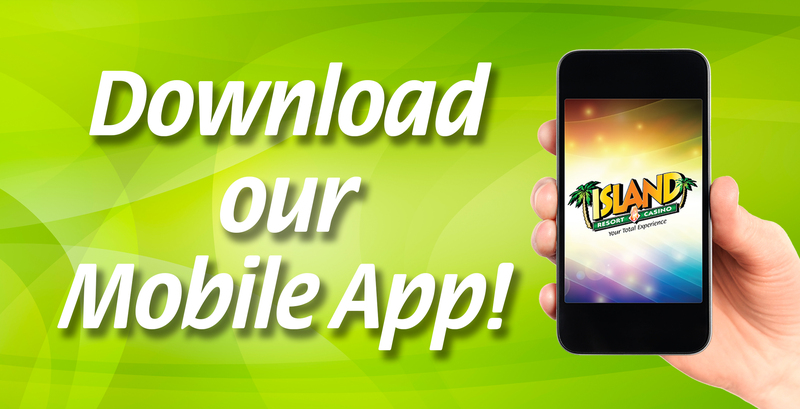 The Island Mobile App is here! Real-time offers (golf, meals, hotel and more), Check Island Club points, and more with the app! Limited Time: Receive $5 promo cash on your card for downloading and linking your Island Club account! Stay up to date with special promotions and events. tickets to an upcoming concert!! We guarantee 100% privacy. Your information will not be shared. Must be 18 or older.